Blame takes place far into the future in a highly technologize world where human existence is of minimal - of near extinction. It's a world where humans, thanks to the Netsphere, once had the ability to connect with the city until a virus (in the movie they call it the "contagion") takes way mankind's ability to connect with the city. The loss of connection meant that humans lost control and machines (known as Safeguards) began recognizing humans as a threat and began eliminating them. Watchdogs, which are camera- like machinery, detect human lifeforms and signal the Safeguards to perform their tasks. Only a small population of humans remain in existence in this world, and they live in a safe zone where the watchdogs are unable to detect them. Food supply for this population have become minimal, so one day a girl name Zuru and few other residents set of to find food outside of the safe zone. In their quest to find food, they bump into Killy, who's mission is to find the Net Terminal Gene; a gene that has the capability to restore the civilization back to human control. That's the basic layout of the plot, though there are many more layers I did not touch upon. The movie sets up this plot quite well, the plot is sprinkled throughout the first half of the movie so it takes a while to understand really what's going on. It's a very interesting plot, though the "threat to humanity" theme is quite old, I enjoy watching creators come up with interesting variations of this theme. I liked Nihei's variation a lot, it's interesting and there are enough plot twists in the movie to retain someone's attention while watching Blame. Everything else in-between the plot is pretty much action-packed. If you know Polygon Pictures than you know that the majority of their work creates projects that are full length in CG. Not everyone is a fan of projects/anime that are entirely done via CG, but I believe this studio does a fantastic job with it. The CG works phenomenally well with the action scenes, and does the movie a lot of justice; I just can't imagine this movie not 100% in CG. 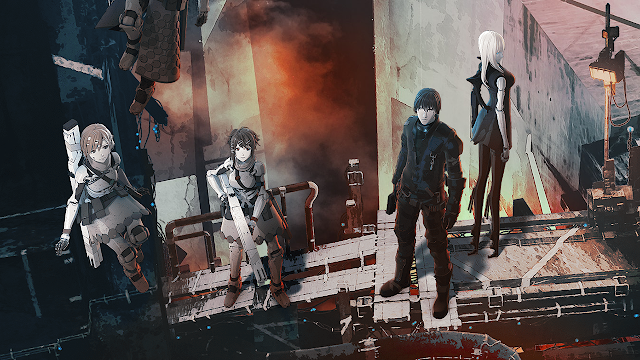 If you're not a huge CG fan, watching Blame might change your mind. The main characters in Blame are Killy and Cibo. Everyone else served very little impact in the film in my opinion, even Zuru. Between Killy and Cibo, Cibo is the far more superior main character in this film. Although Killy was the hero of this film, he was just.. blah. The guy had no personality, the only thing redeemable about him was that he wanted to restore control to the humans, and he was able to flawlessly go after the Safeguards. Cibo on the other hand was much more interesting. From what was interpreted watching the movie, she was a scientist that was preserved in time until Killy brought her back to life. Cibo has the same goals as Killy, but Cibo's the more.. rational one out of the two. Now that I think about it she didn't have much of a personality either, but I found the "technology" aspect of her existence very interesting to watch. If you've seen the movie than you would understand what I mean by "technology." The only portion of the movie that I was somewhat unsatisfied with was with the ending. There's no concrete ending when you look at Blame in perspective. So if you're going to watch Blame, then don't expect the story to have a resolution.. yet. Not to say that the movie wasn't epic, but I didn't let that tainted part of the film sour my overall experience with Blame. I really enjoyed/ loved the movie. The CG was amazing, and watching the plot being unfolded during the movie was very satisfying to watch. Even though Blame did not have a concrete ending, it was announced at Annecy Festival that there will be a sequel film to Blame. I'm assuming by the second film we will get a conclusion to the story (since the manga is complete). Anyways, what did you guys think? Did you enjoy Blame? Are you excited for another Blame movie being in the works? What about the CG? Let me know!